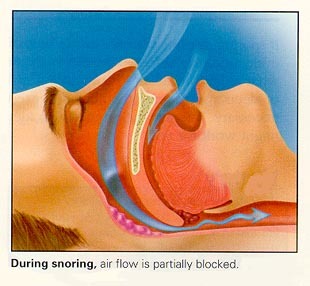 Snoring is one symptom of a group of disorders known as sleep-disordered breathing. It occurs when the soft palate, uvula, tongue, tonsils, and/or muscles in the back of the throat rub against each other and generate a vibrating sound during sleep. Twenty percent of all adults are chronic snorers, and 45% of normal adults snore occasionally. As people grow older, their chance of snoring increases. Approximately half of all individuals over 60 snore regularly. Snoring is associated with physical problems as well as social stress. People who do not suffer from OSA may be diagnosed with socially unacceptable snoring (SUS), which refers to snoring that is loud enough to prevent the sleeper’s bed partner or roommate from sleeping. SUS is a factor in the breakup of some marriages and other long-term relationships. Moreover, a study published in 2002 indicates that people who snore are at increased risk of developing type 2 diabetes. Snoring appears to be a risk factor that is independent of body weight or a family history of diabetes. A patient interview, and possibly an interview with the patient’s spouse or anyone else in the household who has witnessed the snoring, is usually enough for a diagnosis of snoring. A medical history that includes questions about alcohol or tranquilizer use; past ear, nose, and throat problems; and the pattern and degree of snoring will be completed, and a physical examination will be performed to determine the cause of the problem. This will typically include examination of the throat to look for narrowing, obstruction, or malformations. In addition, the patient may be examined by sleep endoscopy. In this procedure, the patient is given a medication (midazolam) to induce sleep. His or her throat and nasal passages are then examined with a flexible laryngoscope. In many cases, sleep endoscopy reveals obstructions that are not apparent during a standard physical examination of the throat. Many patients are found to have obstructions at more than one level in their breathing passages. If the snoring is suspected to be a symptom of a more serious disorder such as obstructive sleep apnea, the patient will require further testing. This testing is called a polysomnography study, and is conducted during an overnight stay in a specialized sleep laboratory. The polysomnography study includes measurements of heart rate, airflow at the mouth and nose, respiratory effort, sleep stage (light sleep, deep sleep, dream sleep, etc. ), and oxygen level in the blood. Decongestants. Snoring caused by nasal congestion may be successfully treated with decongestants. Some effective herbal remedies that clear the nasal passages include golden rod (Solidago virgauria) and golden seal (Hydrastis canadensis) . Steam inhalation of essential oils of eucalyptus blue gum (Eucalyptus globulus) or peppermint (Mentha x piperata) can also relieve congestion. Sleep position. Snoring usually worsens when an individual sleeps on his or her back, so sleeping on one’s side may alleviate the problem. Those who have difficulty staying in a side sleeping position may find sleeping with pillows behind them helps them maintain the position longer. Other devices include a new vest designed to prevent the sleeper from lying on his or her back. Uvulopalatopharyngoplasty (UPPP), a surgical procedure that involves removing excess throat tissues (e.g., tonsils, parts of the soft palate) to expand the airway. The success rate of UPPP is about 53% after five years. The success of the surgery is related to the patient’s body mass before the operation. Radio frequency ablation is another technique that uses scarring to shrink the uvula and/or soft palate. A needle electrode is used to shrink and scar the mouth and throat tissues. Like other surgical treatments for snoring, radiofrequency ablation has a relapse rate over the long term. One of its advantages, however, is that it is less painful than other surgical treatments.